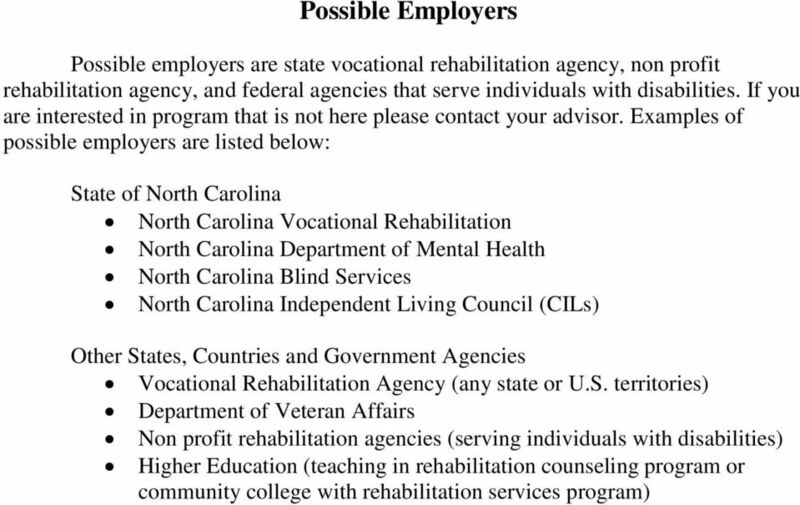 Download "Winston-Salem State University RSA Scholars Program"
4 to workers already residing in rural areas of the state, enabling them to enhance their qualifications for working with persons with disabilities. Activities are centered on the use of the Internet, which minimizes cost and maximizes accessibility. 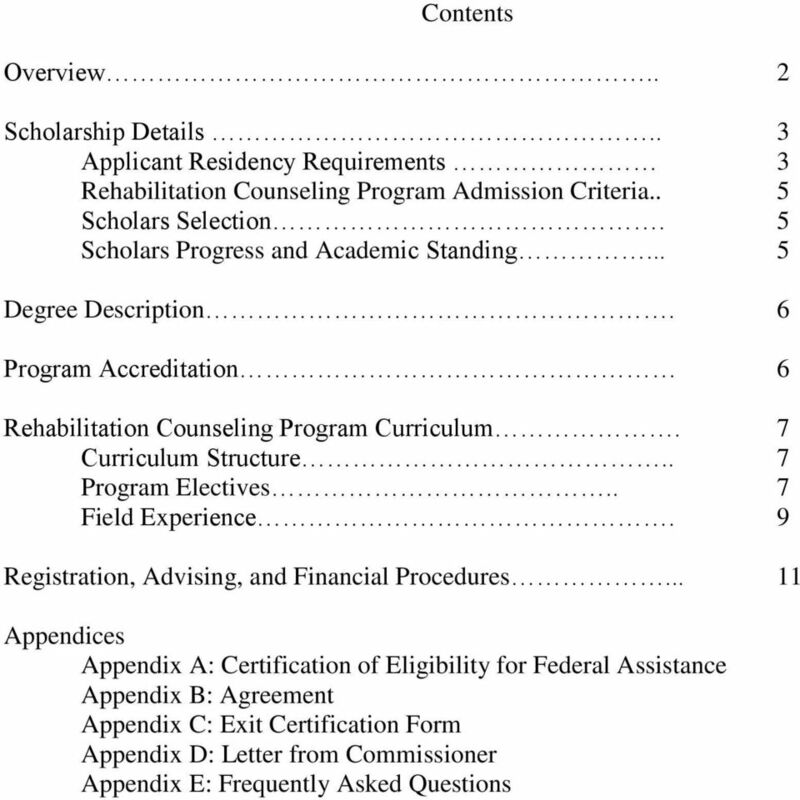 6 Rehabilitation Counseling Program Admission Criteria Several criteria are used in determining qualification for admission. Factors include undergraduate grade point average (GPA) and GRE scores, relevant experience (preference will be given to VR employees), three letters of reference, and personal attributes ascertained through an interview. Applicants are ranked according to academic potential and relevant background/experience. Only those with indication of strong academic and career potential are invited for interviews. During the interview, faculty then rate applicants personal qualifications. Those with the highest combined scores are admitted. Because the number of students who can be accommodated in the Program is limited, admission is on a competitive basis. Therefore, invitation to the interview session is not indication of acceptance. Applicants are notified of the admission review outcome in writing following completion of the interviews. Some applicants not offered admission will be informed that they are an alternate list and may be offered an appointment if one of the admitted applicants cancels enrollment prior to the beginning of the Fall semester. 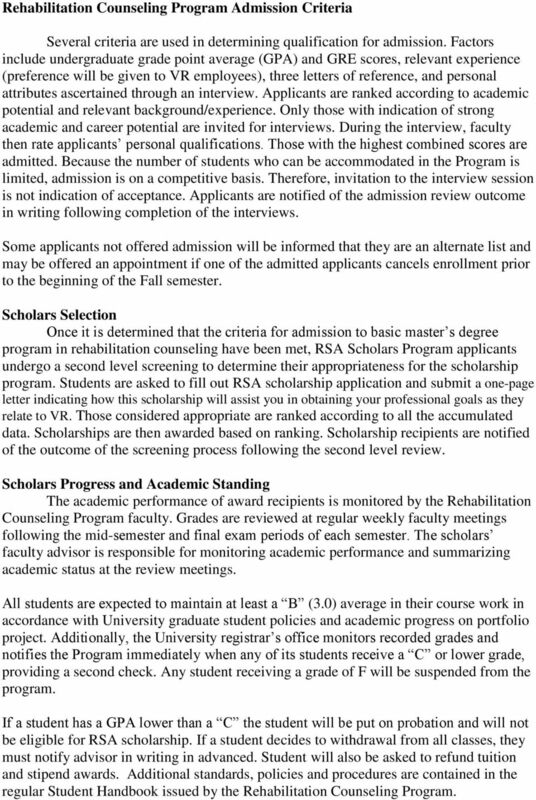 Scholars Selection Once it is determined that the criteria for admission to basic master s degree program in rehabilitation counseling have been met, RSA Scholars Program applicants undergo a second level screening to determine their appropriateness for the scholarship program. 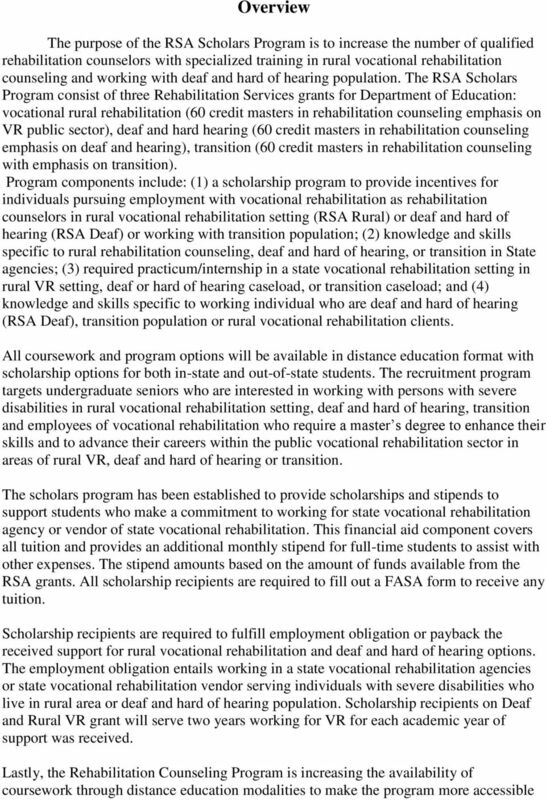 Students are asked to fill out RSA scholarship application and submit a one-page letter indicating how this scholarship will assist you in obtaining your professional goals as they relate to VR. Those considered appropriate are ranked according to all the accumulated data. Scholarships are then awarded based on ranking. 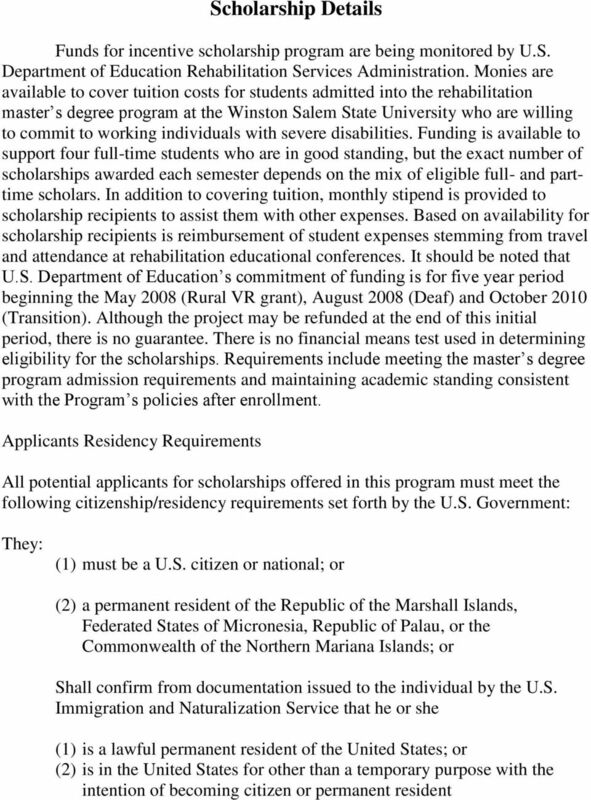 Scholarship recipients are notified of the outcome of the screening process following the second level review. Scholars Progress and Academic Standing The academic performance of award recipients is monitored by the Rehabilitation Counseling Program faculty. Grades are reviewed at regular weekly faculty meetings following the mid-semester and final exam periods of each semester. The scholars faculty advisor is responsible for monitoring academic performance and summarizing academic status at the review meetings. All students are expected to maintain at least a B (3.0) average in their course work in accordance with University graduate student policies and academic progress on portfolio project. Additionally, the University registrar s office monitors recorded grades and notifies the Program immediately when any of its students receive a C or lower grade, providing a second check. Any student receiving a grade of F will be suspended from the program. If a student has a GPA lower than a C the student will be put on probation and will not be eligible for RSA scholarship. If a student decides to withdrawal from all classes, they must notify advisor in writing in advanced. Student will also be asked to refund tuition and stipend awards. Additional standards, policies and procedures are contained in the regular Student Handbook issued by the Rehabilitation Counseling Program. 7 Degree Description The Program offers a Master of Rehabilitation Counseling (M.R.C.) Degree, which is officially awarded by the Winston Salem State University School of Education and Human Performance. The MSRC is a 60 credit-hour professional degree and does not require a thesis but does require research project. Thirty nine of the hours consist of classroom-based course work directed at knowledge and skill development. Nine of these credit hours of study consist of elective courses selected on the basis of student interest and relevance to career objectives. The remaining 12 hours include a clinical practicum and internship that consist of field placements and University-based seminars. These activities are intended to facilitate the development and enhancement of the spectrum of counseling activities within the context of real practice settings, assuring adequate competency to fulfill appropriate professional roles upon graduation. The program is accredited by the Council on Rehabilitation Education (CORE). The programs comprehensive exam is Certified Rehabilitation Counselor exam which is national certification exam for rehabilitation counselors. Students successfully completing the degree requirements are eligible to take appropriate state licensure and national certification exams, which are prerequisites to becoming a Licensed Professional Counselor (L.P.C.) and a Certified Rehabilitation Counselor (C.R.C.) It is pointed out that successful completion for the degree program is only the first step in becoming credentialed. Other requirements, for example, supervised work experience, vary with each credentialing organization. 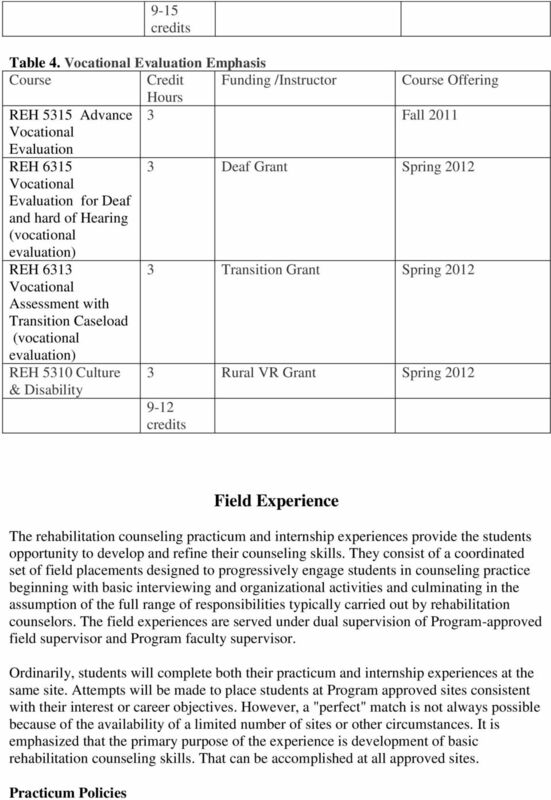 Program Accreditation The Program is in fully candidate by Council on Rehabilitation Education ( ). 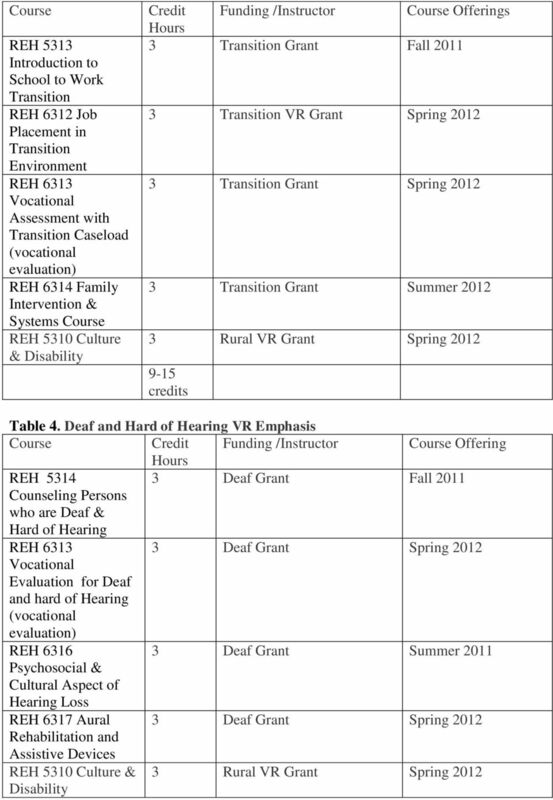 CORE accredits graduate programs in Rehabilitation Counselor Education (RCE). 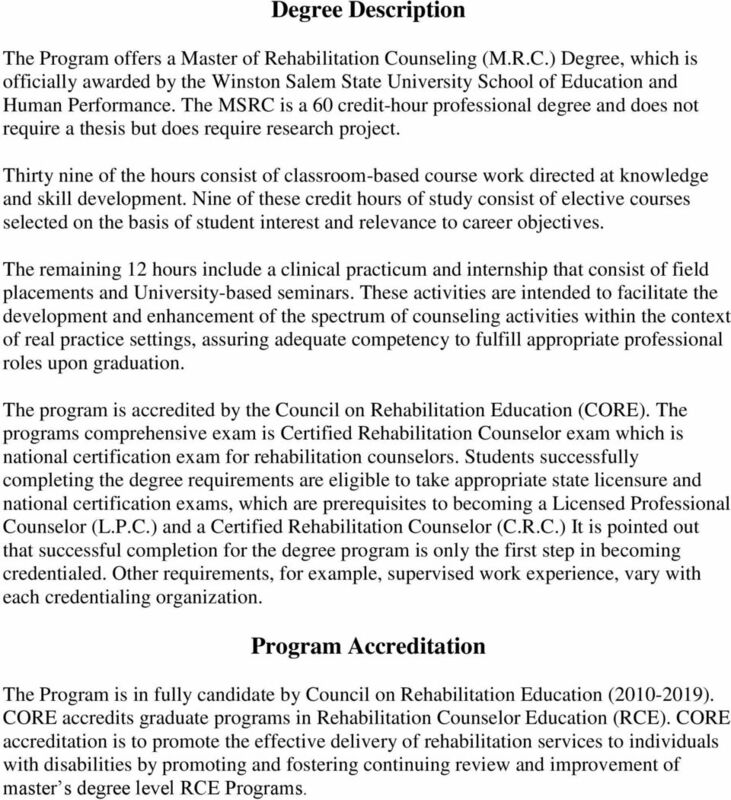 CORE accreditation is to promote the effective delivery of rehabilitation services to individuals with disabilities by promoting and fostering continuing review and improvement of master s degree level RCE Programs. 11 Prior to enrolling in Practicum, students must obtain professional liability insurance and attend fieldwork orientation. This can be purchased through professional counseling associations (HPSO), which offer insurance to students at nominal rates. In order to qualify for the insurance, however, students must be a member of the sponsoring professional organization. Students not providing evidence of insurance will not be permitted to enroll in practicum or internship. 12 Registration, Advising, and Financial Procedures Each semester, RCP faculty meets to review the availability for RSA scholarship funds and graduate assistantships in the program or department, or other sources of funding, and clarify the amount each student is eligible for in tuition and stipend assistance for the academic year. 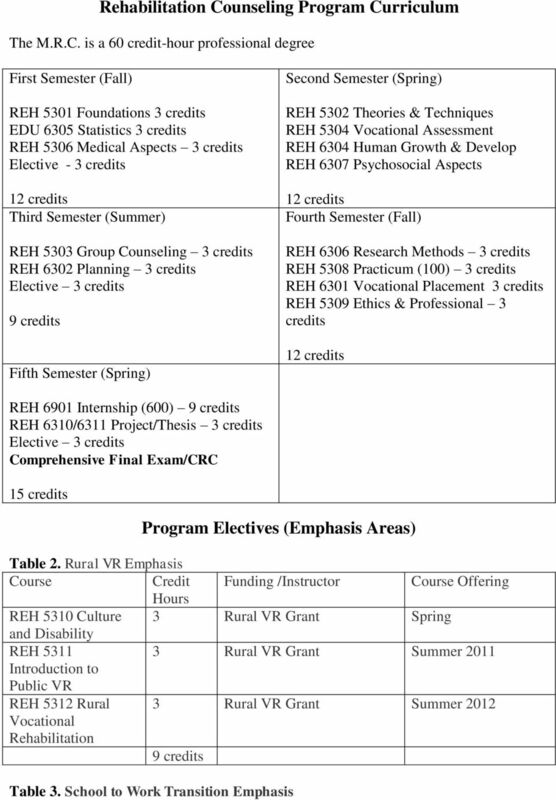 The RC Program will make a list to be sent to all advisors and to the program assistant outlining the students and the tuition and stipend awards for the year. The advisor will meet with the student prior to each semester for registration, to decide on courses, and to complete the plan of study. The advisor will give each student an advising pin for the term they are registering. The RC program director would also sign, as a check step to monitor the funds available from RSA for the semester. 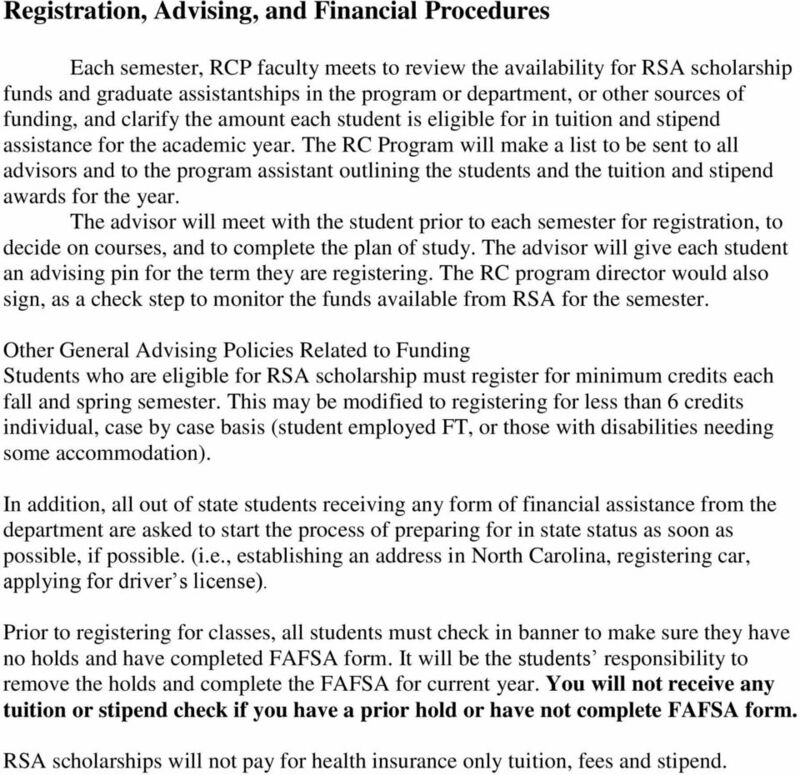 Other General Advising Policies Related to Funding Students who are eligible for RSA scholarship must register for minimum credits each fall and spring semester. This may be modified to registering for less than 6 credits individual, case by case basis (student employed FT, or those with disabilities needing some accommodation). In addition, all out of state students receiving any form of financial assistance from the department are asked to start the process of preparing for in state status as soon as possible, if possible. (i.e., establishing an address in North Carolina, registering car, applying for driver s license). Prior to registering for classes, all students must check in banner to make sure they have no holds and have completed FAFSA form. It will be the students responsibility to remove the holds and complete the FAFSA for current year. You will not receive any tuition or stipend check if you have a prior hold or have not complete FAFSA form. 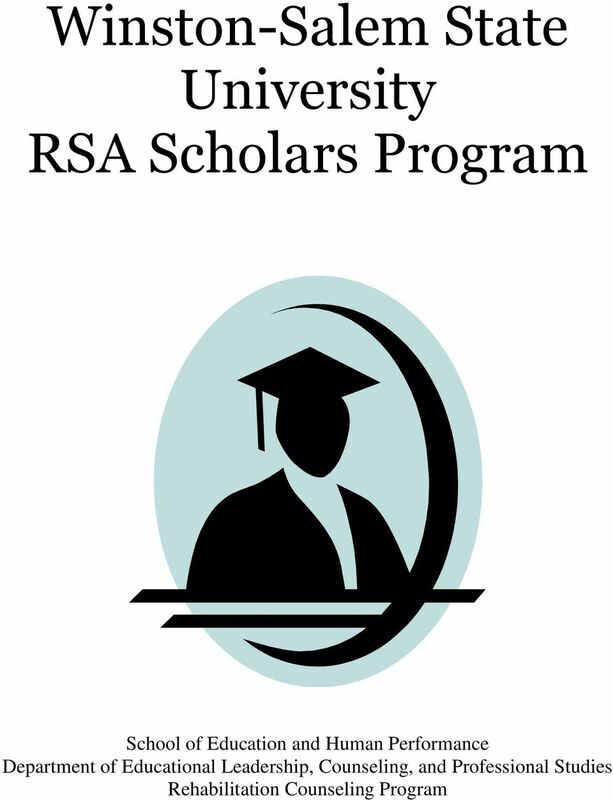 RSA scholarships will not pay for health insurance only tuition, fees and stipend. MASTER OF ARTS IN CLINICAL MENTAL HEALTH COUNSELING (CMHC) Program Description The counseling programs provide coursework and experiential training designed to prepare individuals as professional counselors. Transfer Dictionary Academic Advisor Academic advisors assist students in defining and reaching their academic and career goals. All degree-seeking, undergraduate students are assigned to an academic advisor. 201/201 GRADUATE APPLICATION INSTRUCTIONS All applicants must submit all of the required materials listed below to complete their applications for review. Do not send materials/credentials to departments. SCHOOL PSYCHOLOGY 95. DIRECTOR, SCHOOL PSYCHOLOGY PROGRAM William Robelee, Psy.D. (845) 575-3000, ext. 6016 bill.robelee@marist. mba MBA Admission Requirements Admission Requirements: STEP ONE: Is the MBA program right for you? MBA Admission Requirements STEP ONE: Is the MBA program right for you? To determine if the MBA program is right for you, consider the following questions: 1. Are you ready for greater leadership responsibilities?